THE PICKIEST EATER IN THE WORLD: SINGAPORE DAY 3: THE GRAND FINALE AT IKEA! THE PICKIEST EATER IN THE WORLD AND THE IKEA GRANDE FINALE from richiez168 on Vimeo. 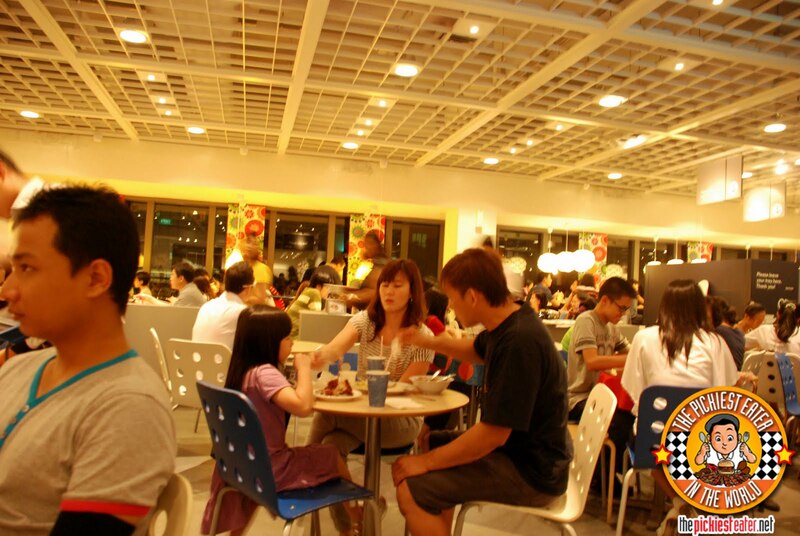 For our "Last Supper" in Singapore, I scheduled a visit to Ikea. Rina and Chaikka were both eager to check out the awesome furniture they had, but I could care less about their lamps, sofas, and what not. I was there for one thing, and one thing only: The Swedish Meatballs. Little did I know that, with the help of my friend Nina, I would discover another dessert that I would add to the Best Thing Ever List! "A few years back, one of my bosses went on a trip to Singapore. When he got back, he brought everyone these cool trinkets. Everyone except me. Of course, I didn't say anything, but since we were pretty close, I was wondering why I didn't get even a key chain or something. While everyone was enjoying their cool souvenirs, he pulled me aside and said, "I know you don't like souvenir pins and snow globes, so I got you something else. I'll give it to you before I leave." It got me a little bit curious. I went with him to his car, and he handed me a moist and slightly bulky plastic bag. "Steam this for a few minutes. Add some cream and hot water to the sauce in the packet. Trust me. You're not going to forget this." Of course, I was happy I got food, but the plastic bag it was in, was a brand name I recognized, but not anything for food. We got there around 7pm, and we couldn't find seats. Based on the look on my face, Rina was worried someone was about to get hurt. And just like that, I was introduced to the awesomeness of Ikea's Swedish Meatballs. Every time a friend heads off to Singapore, (like my buddy, Ted) I always swallow my pride and ask them to bring me back some. Everyone that has, bought a batch for themselves, and got hooked instantly as well (Again, like my buddy, Ted). Since that day I tried it, whenever someone mentions the name "Ikea" to me, I always reply, "You mean the place where they make the meatballs?" I'd usually get a reply along the lines of, "errr.. no.. the Furniture store." They'd look at me really weird, like I was so far off. Obviously they had no idea about the wonder that is Ikea's Swedish meatballs. I'd just give out a small patient smile, place my hand on their shoulder, let out a soft sigh, and say, "Oh you poor thing." 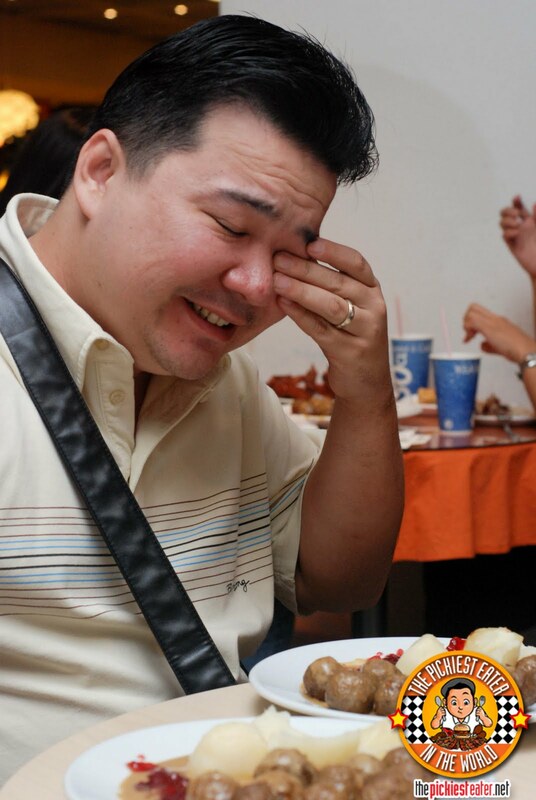 O, anong tinitingin-tingin mo diyan? I was supposed to go to the Ikea Tampines branch, as recommended by my friend The Condo Chef, however our friend Grace, a Singapore resident, said it might be a little easier to get to the Alexandra branch from our location. We got to Ikea Cafe at around 7pm and guess what? The line was ridiculous. Seriously, it was longer than any of the rides that we had to go through in Universal Studios (Love you, Express pass!)! Regardless, I told the girls to look for a place to sit, and I would be the one to brave the lines, as well as handle ordering duties (As if there was any question of what we would order). Waiting in line for 45 minutes tends to drain a person. But totally worth it. 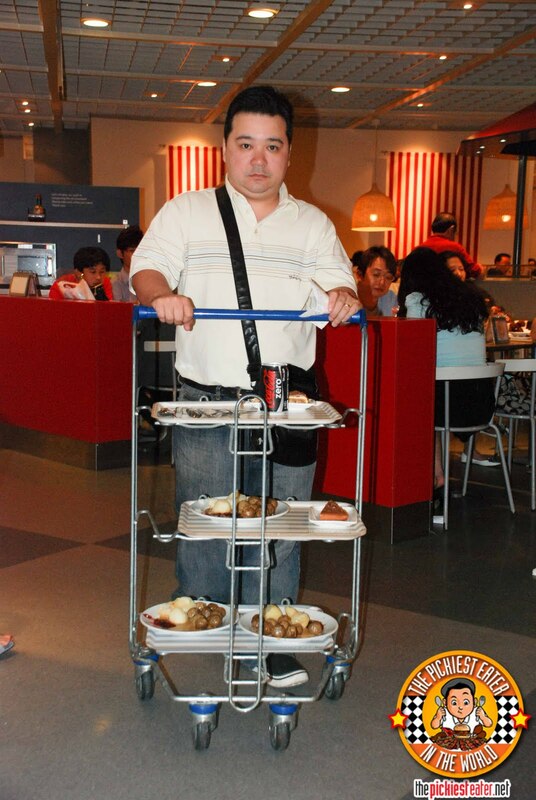 When shopping for food in Ikea, they give you these little carts to carry your orders in, which I found to be really cool. Its a cafeteria style of service, meaning you line up and point out the order you want from the choices in front of you, and they slap it on the plate and hand it back to you. Drinks, and cakes are displayed in a refrigerator, so you can help yourself. Judging by the number of trays that carried the The Swedish Meatballs, or "Kottbular", it was clear that the legend of Ikea's most popular dish had captivated the country of Singapore as well. and deservedly so. It really is one of the best things you'll ever try. 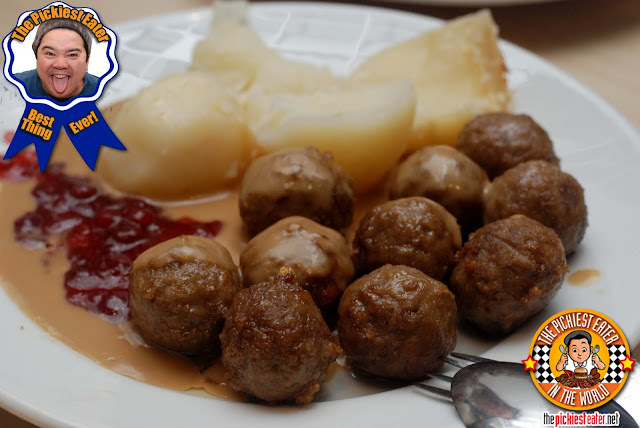 Each order consists of 10 meatballs drowned in their famous cream sauce, and a bit of lingonberry jam, and two boiled potatoes. Given the amount of people lined up for their food, its hard to fault the staff for their sloppy presentation, which in actually, wasn't so bad, especially given the circumstances. In my opinion, the secret of the dish lies in the gravy sauce. 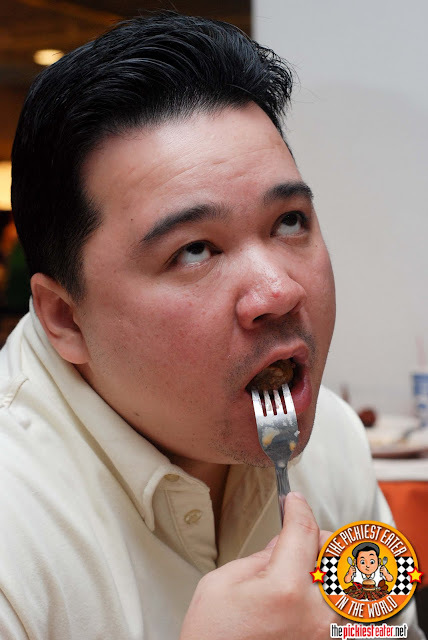 I was thisclose to licking it off my plate when I ran out of meatballs. If it wasn't for Rina's deathly stare when she saw me pick up the plate and lift it near my mouth, I might actually have done it (My reasoning of "We're in Singapore, for gosh sake, no one knows me here! ", only seemed to anger her more). The mixture of the lingonberry jam, the cream sauce, and the savory meatballs all worked together to create a party in your mouth. The only weak link would be the potatoes, which were cooked beautifully, but flavor-wise, didn't offer anything new. To me, it served as a suitable substitute for rice. For Rina and Chaikka, not so much. They should rename it to "Gawd Daim"! 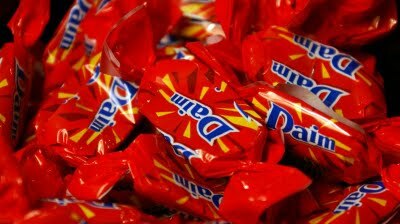 Before we go any further, let me introduce you to my favorite Chocolate: Daim. Daim is a crunchy butter almond bar, covered in Milk Chocolate. In our region, I've only found the smaller candy sized version, which is one of the most addicting things ever. I've actually driven to Subic with one purpose in mind: Get a bag of Daim (Or in my case, three bags of Daim). Given my love for Daim, it would come to no surprise to you to hear that I went absolutely ballistic when my friend Nina told me that Ikea has a Daim Cake (Sweden Rocks)! When I was in line, the first thing I got was two of these bad boys.. one for Chaikka and Rina, and one for me. Dessert lovers, you are going to die when you try this. I won't lie to you, it's a sugar bomb, so if you don't like cakes that are so sweet, then this might not be your thing. 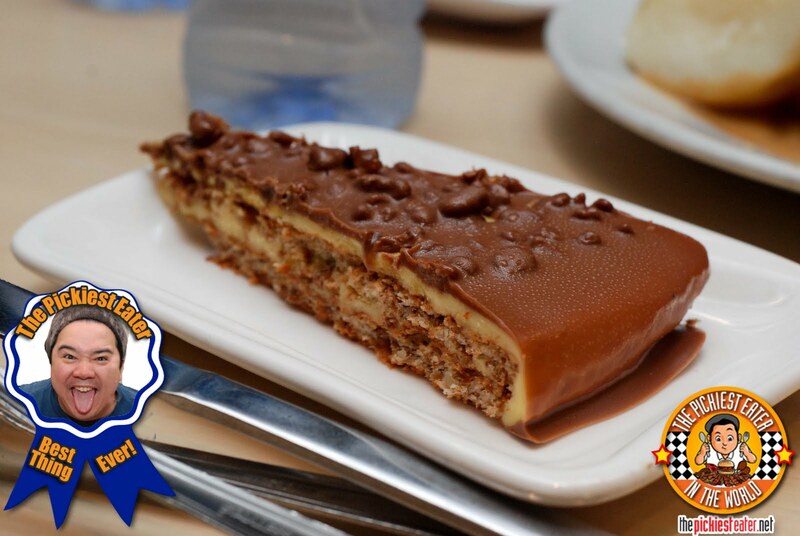 But I loved how the creamy torte accentuated the milk chocolate topping, which was complete with crumbled bits of Daim! Easily, one of the best desserts I've ever had! 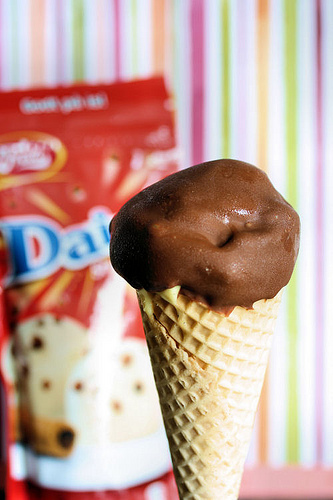 You shall be mine some day.. Oh yes.. you shall be mine..
Oh, and I did a little research and I found out that Daim also has Ice cream flavors.. oh man.. you can believe i'm on the lookout for that!!! 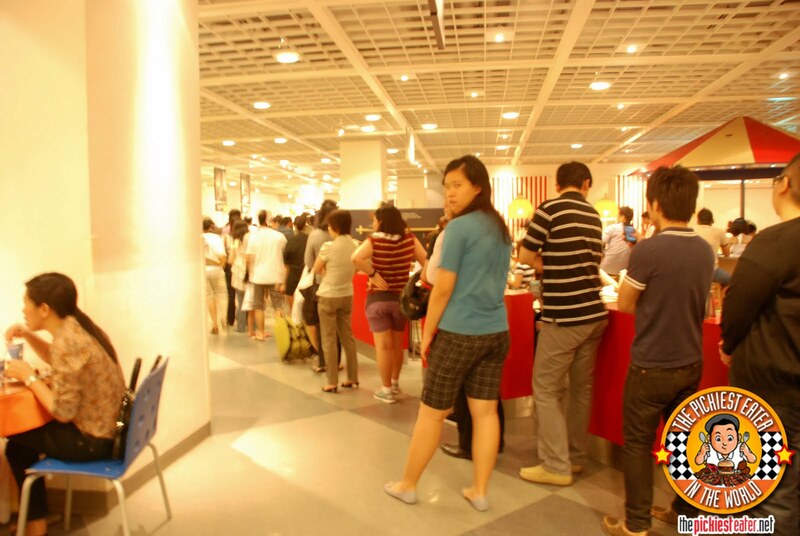 No Joke - The three of us actually had more fun roaming around Ikea's amazing showrooms, than we did at Sentosa. Too bad they're strict about photography, so we couldn't get any pictures in any of the showrooms. Also, if you go to the Alexandra branch of Ikea like we did, It would be best to go with the number of a cab company saved in your phone, because we stood in line for 2 hours waiting for one to pass by, before I decided to make the international call to do so. Apparently that branch is located in an area that cabs don't seem to pass through at that time of the evening (we lined up by around a little past 9pm, we got a cab by 11pm). It may be hard to get through to an operator at first, but once you do get through, you cab should be there within 10 mins, max. This is where my Singapore posts comes to an end. I really hope you enjoyed this because it will be my last International trip for awhile (We have a baby on the way). After this, it's back to regular programming with good old fashioned Pinoy restaurants!! Oh yeah.. It's the Holy week break.. So my next "Official" post will be scheduled on April 25..
Have a blessed Holy Week, everyone! !